Keep reading for a detailed review of the good and bad things about the Samsonite Aeries! NOTE: If you are in the USA, this suitcase is known as the F'lite. We have covered it in this Zipperless suitcase review. Should You Get The Samsonite Aeris? The Aeris is available for purchase in 3 different sizes. All of them are supposed to be checked; however, you might be able to get away with the 25” as a carry-on, depending on your luck. 31.9” x 23.2” x 13.4"
The Aeris is a zipperless suitcase and it features latch closing. Zipperless luggage is generally considered to be more secure, because zippers are quite easy to break into, regardless of whether your suitcase has a lock. In terms of the materials, this Samsonite suitcase is made with 100% polypropylene material. Although this is a lightweight material, it does not perform as well as polycarbonate, in terms of durability and impact resistance. However, it is also cheaper than polycarbonate, which is reflected by the price of the Aeries. It might not be a cheap suitcase, but it is less expensive than the Neopulse, for example, which is made of polycarbonate (which is often more expensive). A cool thing about these suitcases is that they are available in a variety of vibrant colors. You could go for the classic black, if you want to, but you could also be more bold and go for the turquoise one (I would)! All colors feature a matte finish and grey accents (handle, latch, wheels etc.). Matte is always great for not showing scratches too, another bonus. Additionally, the front of these suitcases has a subtle Samsonite logo print, which I actually find to be very nice. I did find one downside in the design of the 31” Aeris – it is a very big suitcase, and if you pack it fully, you will most likely go over the airline’s weight limit for checked luggage. If you don’t want to pay extra fees, your suitcase will be half empty most of the time. On the other hand, if you don’t mind paying the extra fees and really need the space, then this isn’t even a downside for you. With the Aeris you will get limited 10-year global warranty. However, the warranty only covers manufacturing defects. And, in the case of a manufacturing defect, Samsonite will gladly repair or even replace your suitcase. If, however, your suitcase should need repair due to damage in transport, you are left to your own devices. So, always have travel insurance. Good news for everyone who travels to the United States often – the Aeris has a TSA friendly lock. It is 3-digit combination lock; the initial combination is 000 but you can set up your own in a matter of minutes. Once you set it up, your belongings will be protected, and no one will be able to access them. Well, that is not entirely true. The point of TSA locks is that TSA agents are the only ones (apart from you) who can unlock them. They will randomly choose luggage for inspection, and if it doesn’t have a TSA lock they will open it up forcefully. This could damage your suitcase irreparably, or leave you without a lock. So, my advice, always choose one with this type of a lock! Are you tired of sore arms and back pain? Well, with the Aeris you can say goodbye to them! This suitcase is equipped with 4 spinner wheels that will make your travels much more pleasant. They put less strain on your arms and shoulders, and guarantee you a pain-free trip. Each wheel can turn 360 degrees, which means that you will never again have to tilt your suitcase so you can roll it. You can push it alongside you, or even in front of you – whichever way you find most comfortable. The handle on the Aeris is a single-barrel pull handle, and it can be locked to several different heights. A benefit of the single-barrel design of the handle is that the indent inside the suitcase itself is as small as it can possibly be. Additionally, this type of wheel handle weighs less than a double-barrel one, so it’s a cool way for Samsonite to make the Aeris as lightweight as possible. The pull handle also has an integrated address tag in it. Additionally, there are 2 carry handles on this suitcase. One is on the top, and the other one is on the side, next to the TSA lock. One thing I don’t like about these handles is that they are pure plastic – they don’t feature any other material on them that would make them feel more comfortable in hand. This could be a problem if you actually have to carry your suitcases for a long period of time (up a few flights of stairs, for example). The Aeris opens up into 2 packing compartments. In the bottom compartment, there are elastic straps to keep your stuff in place. In the top compartment there is a divider panel that can be secured with hooks. The divider panel has one meshed pocket, and it is the only pocket in the suitcase. That is a shame because (if you read some of my other reviews) you know how much I love pockets! One obvious thing that makes the Aeris stand out is the lack of lining on the inside. I consider this a plus, because when you think about it, lining just takes up unnecessary space and adds to the weight of the suitcase. Plastic is also much easier to clean than fabric, especially if you have to deal with a shampoo explosion. Overall, the interior of the Aeris is very minimalistic, which I find to be a good thing. If you need a new suitcase, the Aeris looks like a pretty good option. You can get it in 3 different sizes, so choose wisely – you don’t want to end up with a suitcase that is smaller or bigger than you need. It has some cool features, like the spinner wheels and the TSA lock. The biggest benefit of the Aeris is that is zipperless and has latch closure. With both the latches and the TSA lock, you will always have peace of mind when it comes to the safety of your luggage. The interior of the Aeris is very simple with no lining, and with small protrusion of the single barrel pull handle. This allows you to optimally make use of the space inside the suitcase and pack as much stuff as you need. 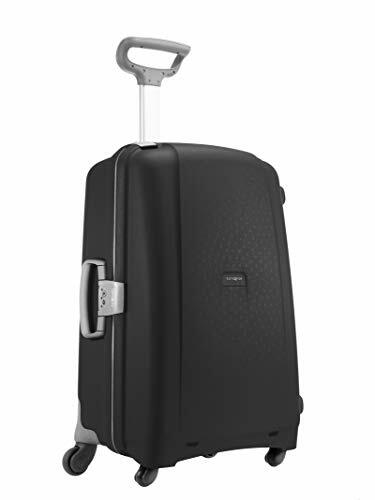 Samsonite Aeris Spinner 75cm hard sided suitcase. Spinner 4 wheel facility. 87.5 Litre Interior offers an extra divider pad with zipper pocket for easy and organised packing. Combination lock and two side clasps. However, be careful with the largest version. You could easily exceed the weight limit for checked luggage if you over pack it, which will result in extra baggage fees. If you love the Samsonite Aeris, head over to Amazon to get a outrageously good deal on it!